I am often asked through this website, and my Youtube channel, where, in my opinion, is the best place to stay in Fuerteventura. The main resorts in Fuerteventura are Corralejo, Caleta De Fuste, El Cotillo, Costa Calma and the Morro Jable / Jandia area. Every one of them is different so at least one of them should appeal to you. 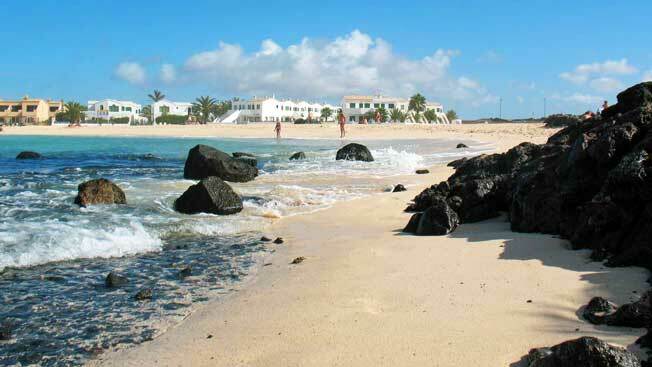 Corralejo is located on the north east of the island, about 30 minutes from the airport. It has a large sheltered bay with views to Lanzarote and the small island of Lobos. On the outskirts are the wonderful sand dunes of the natural park with some amazing beaches. Corralejo also has a life outside of tourism, which is one of the reasons I like it, with schools, health centre and a working port with ferries to Lanzarote and the Island of Lobos. There are many different types of restaurants, many with great sea views, serving Spanish, Italian, Indian, Chinese, English and even Danish cuisine. Many serve fresh fish straight from the fish market in the harbour. There are some quiet bars, some great music bars and some nightclubs. There is the only water park on the island in Corralejo too. You can also take buggy trips, boat trips to Lobos and other things to keep kids amused. You can read my full review and watch my video of Corralejo – Corralejo – What is it like? 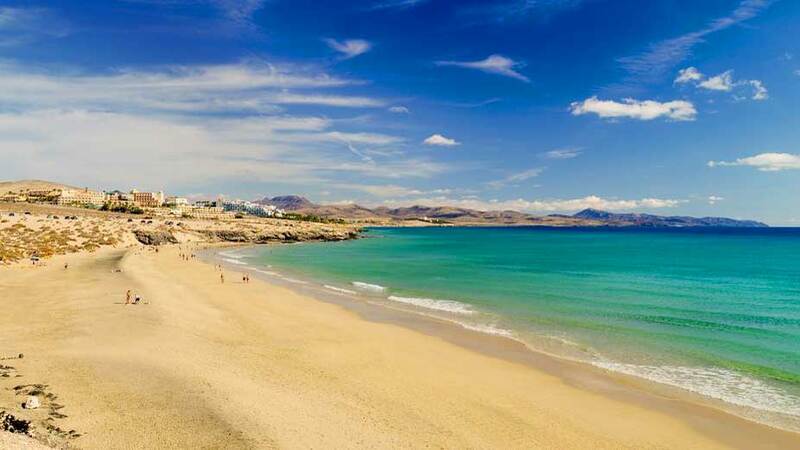 and my review and video of all the beaches – Corralejo Beaches – best beaches in Fuerteventura If you are looking for naturist beaches then the dunes beaches are clothing optional. Corralejo has a great variety of accommodation from all-inclusive hotels, holiday complexes, beachfront villas with private pools and apartments. Caleta de Fuste is located just a few miles south of the airport. It is a resort that has grown up from nothing over the past 40 years into a large tourist town with hotels, apartments, marina and golf courses. It is primarily frequented by British tourists. There are two man-made beaches looking onto a sheltered bay which are very safe for families. The beaches have sunbeds, parasols etc for hire and there are some showers and a childrens’ play area. There are no naturist beaches around Caleta. You can walk all along the sea front from the harbour all the way to the Atlantic shopping centre. Caleta doesn’t have one main “strip” like other resorts but a number of smaller centres with shops and over 100 bars and restaurants. The only McDonald’s on the island is in Caleta. Nightlife in Caleta de Fuste mainly revolves around the bars, many of which have music but there is a nightclub open until the early hours. To the back of Caleta there are two golf courses – Fuerteventura Golf Club (a championship course used for the 2004 Spanish Open) and also Salinas Golf. If you want to see what Caleta is like then read my review and watch my video – What is Caleta de Fuste like? The main sea front area is lined with hotels and their grounds, with apartments and villas stretching away from the sea. There are many beautiful villas surrounding the golf courses and plenty of villas and apartments up Chipmunk mountain (the hill behind the resort). 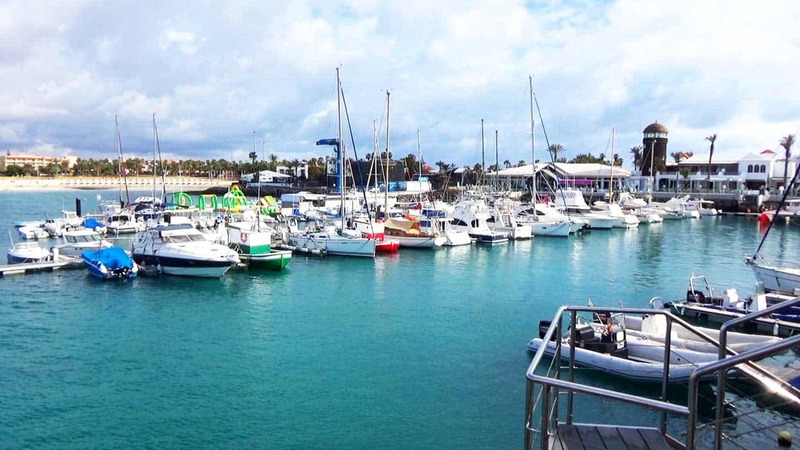 El Cotillo is a lovely quiet fishing village on the north-west coast that has expanded with tourism but still manages to retain is quiet village feel. In fact it is my choice for the best place to stay in Fuerteventura – but I am biased and like peace and quiet. It is perfect for a relaxing holiday for couples of all ages with lovely beaches, some being quiet and safe for swimming (for children too) and others popular with surfers and kite surfers. There are plenty of good restaurants and bars. Some have live music once a week. Most people opt to rent a private apartment and sample some of the lovely restaurants in the village as well as self-catering. 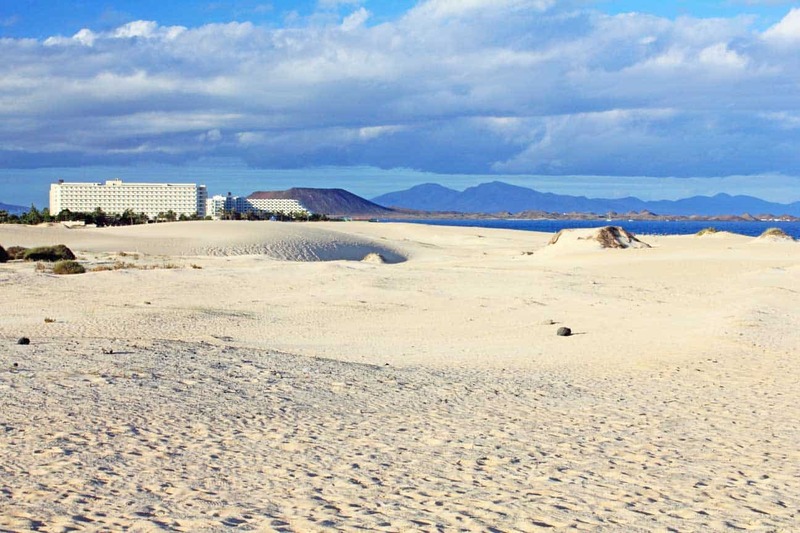 Costa Calma is about a 30-40 minute drive south from the airport on the south-east coast. It is frequented quite often by German tourists but has plenty of other nationalities staying there too. The beach is beautiful and runs for miles all the way south to Morro Jable. It is a small quiet resort. There are a few bars but they are mainly bar/restaurants and these are mainly located in the commercial centres around the town. There is not a main strip of bars and shops that you get elsewhere. Many people opt to stay in one of the large hotels that run along the sea front. There are plenty to choose from. Most of the family hotels have plenty of activities for children. Oasis Park, Fuertevenurias zoo, is not far away. H10 Sentido Playa Esmeralda – Adults only. Lovely hotel right on the beach. Sol Beach House at Meliá Fuerteventura – Adults only. Attached to the Melià Hotel. This is the most southerly resort area in Fuerteventura and is over an hour from the airport. 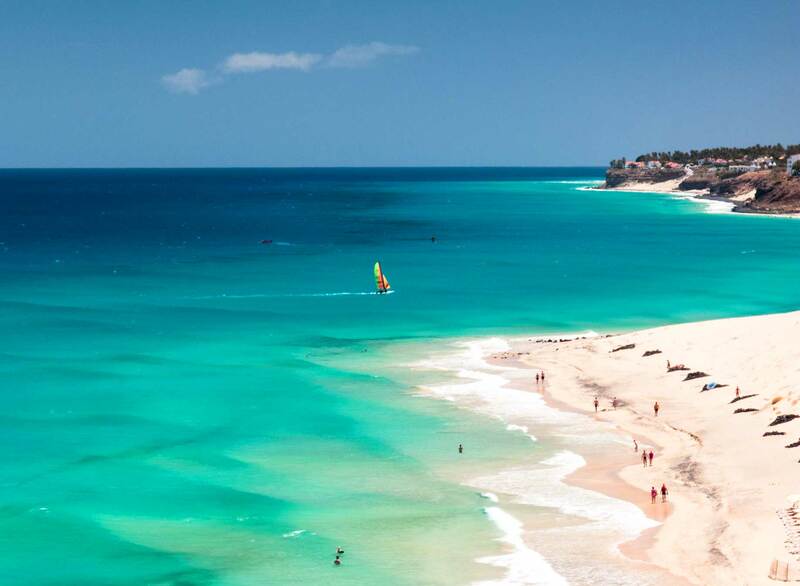 The beaches that run all along this area are spectacular with white sand and turquoise sea. Morro Jable town itself has a nice Spanish feel to it with some good shops, bars and restaurants. There is also a port with ferries to Tenerife and Gran Canaria. The tourist part, where most of the hotels are located, has shops, bars and restaurants along the beach road. You can catch a 4×4 bus and go to the remote Cofete beach. Oasis Park, Fuerteventura’s zoo, is not far away. Iberostar Gaviotas Park – All inclusive and highly rated. Three outdoor swimmiing pools. I hope you find my resort guide to the best place to stay in Fuerteventura useful and you have a great visit when you come.